Is TrueFlip a Scam or Legit? Read Reviews! Whether you want to play in English, Spanish or Russian, if you’re looking for a blockchain lotto game, TrueFlip.io might be the place for you. I’m still trying to get my head around this daily online lottery game. The game itself is straightforward. My problem is the calculations on what you actually win – how much is the jackpot. Well, that and it would be nice to know who these folks really are. This is a daily lottery that players choose 5 numbers from 1 and 49 and 1 extra number from 1 to 26. TrueFlip.io uses a random computer system to choose the winning numbers each day. This is all based on bitcoins. That’s what you pay to play and that’s what you win. The draw takes place each day at 20:00 GMT. Firstly, TrueFlip says that 50% of the ticket costs goes to prizes with the rest going to other costs. That 50% is divided up in a multiple tier prize. The rest goes to their costs ranging from promotion to services. The jackpot is published in bitcoins and again, I struggle to get my head around those figures. It looks like they pay out on the jackpot less 4% commission. The latest game has a jackpot of 109.30 bitcoins which equals US$ 485,543.02 – according to their exchange rate. If you can encourage a friend to play, TrueFlip.io will give you a free ticket plus 2% of any of their winnings. I guess that comes out of the other 50% of what people are paying. So Who Is True Flip? TrueFlip.io is owned by TRUE FLIP GROUP SOCIEDAD DE RESPONSABILIDAD LIMADA, a company registered in Costa Rica. There are a bunch of social media links, but no real contact information except an online form. We’re talking no live chat, no phone numbers and no snail mail address. I guess they are like bitcoin operating in the ether. Hang on – What Is Blockchain? I read up on this and after several sites and hours, I still don’t get it. I think it has to do with the fact that the basis of paying and winning is through an unregulated monetary system i.e. bitcoins. But is that it? Me, I like my money in dollars, preferably that good ole US dollar stuff. True Flip has this one area, underlining why to play. They claim here that 60-65% of your payment goes to the prize fund. That’s not what I read elsewhere. It is anonymous so you probably can duck taxes and other things, but then again, the jackpot doesn’t get up to those levels we see with US Powerball and Euro Millions. Then again, the odds are better. Would you mind rating TrueFlip.io? Folks, this looks legit and if you are into playing and winning in bitcoins, this site does look like it provides a daily game with good odds. The only problem is based on what they say, it’s a little grey on what actually goes to prizes and what goes into their pockets. 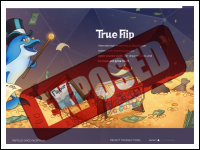 TrueFlip.io gets thumbs down mostly because of the lack of contact details and no information on who they are. If you are playing with these folks and have won, please speak up. It looks like a clean game to play at the same time, I’m sticking with US Powerball going after that big mega win! 1) TrueFlip jackpot is now $2.5million worth of bitcoins. 2) They have released a new game that happens every blockchain block, 5-60 min. 3) They are working on getting a gambling licence from Malta or Isle of Man, both highly reputable. 5) Their fair draw process works like a charm and is 100% transparent. 6) 60% of the ticket sales goes to the jackpot.